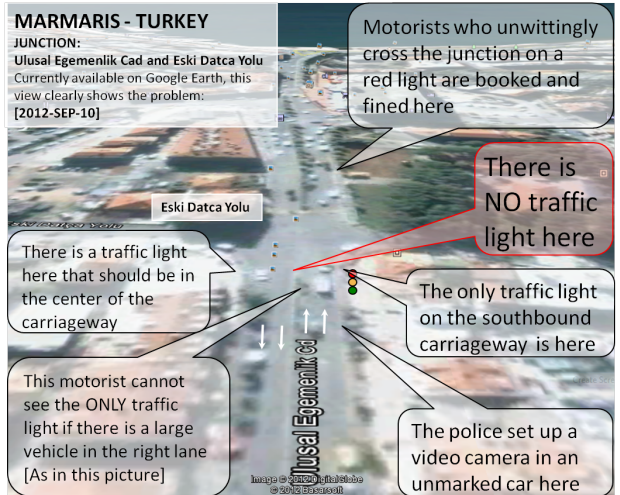 I am writing this to place on record the potentially dangerous traffic light arrangement that exists at the junction of Eski Datca Yolu and Ulusal Egemenlik Caddesi in Marmaris, Turkey. There is no traffic light on the central reservation for the left hand lane for southbound motorists. The ONLY traffic light on the southbound carriageway is on the right hand lane. If there is a minibus or larger vehicle in the right hand lane this traffic light is totally obscured from the vision of car drivers in the left hand lane. 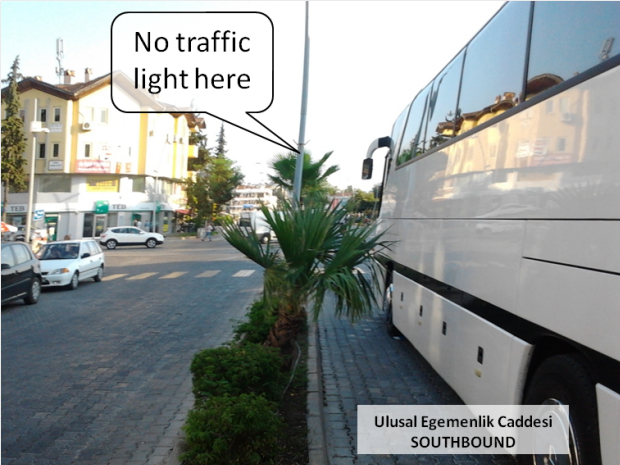 There is a north facing traffic light on the far side of the road on the northbound carriageway which is in the wrong position for southbound traffic, a location inconsistent with all other dual carriageway traffic lights in Marmaris [and elsewhere in Turkey]. This traffic light is also occasionally obscured by passing northbound traffic, particularly during busy periods. Each carriageway is a separate road, motorists do not expect traffic signals for the carriageway they are traveling on to be on the other carriageway. I unwittingly crossed this junction on Friday, September-07, unaware that it was controlled by traffic lights. The fact that there were three other motorists in the queue ahead of me for 'crossing the junction at a red light' is proof, if any were needed, that the traffic light arrangement at this junction is confusing, technically incorrect and more importantly, dangerous. Judging by the number of 'convictions' taking place during the short time I was there I am sure the disproportionate number of traffic light 'offences' occurring at this junction is a matter of verifiable record. What I find particularly disturbing is the fact that the police are obviously aware of this anomaly and instead of arranging for the problem to be rectified by the responsible authority, they are instead 'cashing in' by setting up a traffic light violation trap for unsuspecting motorists. The only crime I consider is being committed at this junction is the failure of the police to rectify a potentially hazardous and life threatening situation. It is only a matter of time before there is a serious or fatal accident, the police in their complicity would be partially responsible. I am no road traffic expert but I have been driving for fifty years, I have driven in over thirty different countries and I have never been booked for ignoring a red traffic light and I have never in my life come across such a blatantly cynical road traffic trap. It is my sincere hope that this letter will prompt action on someone's part to arrange for the misplaced traffic light to be moved to the central reservation so that southbound traffic on Ulusal Egemenlik Caddesi can clearly see the traffic lights and be provided with the safe traffic control system they expect and deserve. Under the circumstances it seems to me that it would also be appropriate to reimburse those motorists that have been fined for crossing this junction in the belief that there were NO TRAFFIC LIGHTS and to have this 'misdemeanor' erased from their record. The image below is taken from the Google Earth website and by chance perfectly illustrates the situation. In the image there is a car in the southbound left lane and a lorry in the right hand lane that is obviously obscuring the traffic light. There are many occasions when oncoming traffic completely obscures the north facing traffic light placed on the Northbound side of the road. I would be grateful to receive your comments and details of what action [if any] you intend to take to rectify the problem.